Microsoft Azure has excellent tools and storage capabilities, but if you want to move lots of data to and from Azure, you need this course. See how to ship hard drives using Microsoft standards to send and receive data from your personal data store. Sending large amounts of data to or from your data cloud storage can be expensive due to long wait times or metered connections. 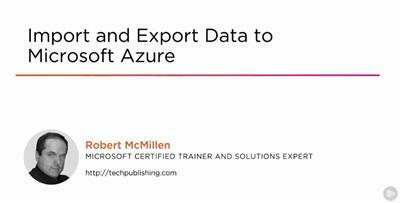 In this course, Import and Export Data to Microsoft Azure, you'll gain the knowledge you need to work with Microsoft Azure to send and receive data by using the shipping method and the WAImportExport tool. First, you'll learn about disk encryption using Bitlocker. Then, you'll explore how to backup and ship keys, how to create Blob and General Purpose accounts, and how to import and export data to and from these accounts. Finally, you'll see how to ship hard drives using Microsoft standards. When finished with this course, you'll have the skills and knowledge to properly import and export data to Microsoft Azure using Microsoft processes and procedures.